This week on an all new episode of the Podwits podcast, the boys do a show about them prepping to do a show while at the same time, doing a show. Sound confusing? Well imagine being a part of it! They chat about concepts of time and exactly what the heck the Podwits are doing when they are not being spun on the old jukebox; they also delve into My Little Pony & Dion’s discovery of what Bronies are, which leads into a long pseudo-psychoanalysis of modern cartoons; J. spells his love out for Kevin Smith, including the director’s latest film Tusk; and is using Dramatic Shorthand a cop-out? As well as what kind of TV do you watch when stuck in the ER for 8+ hours like Dion was the other week- the lead is not buried, we do find out the gory story about why he was spending so much time watching television at the local Emergency Room. 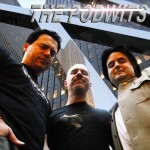 So come on down and have a listen to another always enjoyable and thought-provoking episode of The Podwits! Here is the Jason Biggs Twitter controversy from 2012 eluded to in the podcast.